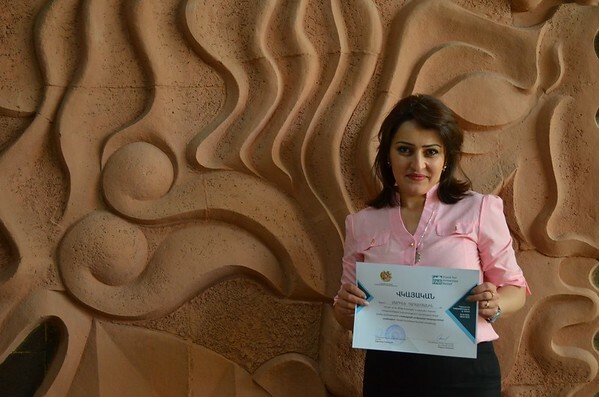 The 14-day interactive Training of Trainers (ToT) course, which was held in Yerevan, gave Marine and eight other nurses the needed credential to lead trainings in general medical care to roughly 35-40 nurses in their home villages. Marine will next instruct three different groups of 10-15 nurses in Hadrut. The ToT is part of FAR’s brand-new Training of Artsakh Regional Nurses Program, and includes interactive theoretical and practical courses taught at Armenia’s National Institute of Health in Yerevan and other relevant medical centers. The program, which was made possible thanks to the visionary generosity of the Nazarian Family Foundation and continuing guidance and support by outstanding FAR friend Dr. Raffy Hovanessian, aims to empower more than 400 nurses from Artsakh over the course of three years. A total of 120 nurses from four regions of Artsakh — Hadrut, Martakert, Kashatagh, and Qarvachar — will be trained during 2018. FAR Health Programs Director Doctor Hambardzum Simonyan stated that, in time, the number of rural communities where a nurse is the main healthcare service provider is increasing; essentially the nurse often has to act both as a nurse and a doctor. “The biggest challenge still remains the lack of doctors and the long-distance that people have to travel in order to see a doctor. That’s why empowering nurses in these regions is a priority for us,” said Hambardzum.